June is Pride Month, a month to celebrate gay, lesbian, bisexual, transgender, queer, and asexual people, plus all other sexual orientations and genders. 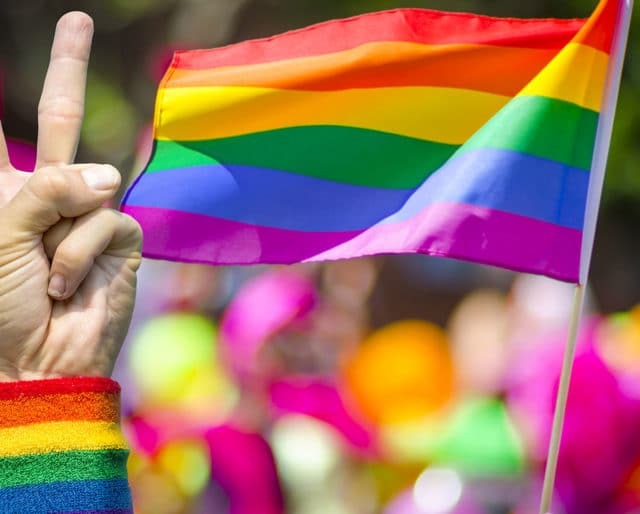 The month is celebrated in June in commemoration of the Stonewall Riots, which kicked off the first major demonstrations for gay rights in America. On June 28, 1969 police raided the Stonewall Inn in New York City’s Greenwich Village, but bar patrons — gay men and drag queens — fought back, a spontaneous incident which is now marked as the beginning of the gay rights movement in the United States. Brenda Howard, a bisexual activist, organized a march and other events to commemorate the one-year anniversary of the riots and is known as the “Mother of Pride.” Today, Pride Month features marches around the country, educational and awareness events, and parties to celebrate gay pride! Gilbert Baker's original design of the rainbow gay pride flag is flown at the San Francisco Gay Freedom Day Parade. NYC police raid the Stonewall Inn, instigating the Stonewall Riots. The rainbow flag is also known as the pride flag, and June is a great time to wave it! The original gay pride flag was designed by activist Gilbert Baker after fellow activist Harvey Milk challenged him to design a symbol of pride for the gay community prior to the Gay Freedom Day Parade on June 25, 1978. Today the flag is widely recognized as a symbol for LGBT pride. So whether you hang a flag outside your house or put on a rainbow tee, let your colors fly! Cities and communities around the country hold Pride marches during Pride Month. Join LGBTQA+ people and allies to celebrate gay rights and equality for everyone! The parades are inclusive, entertaining, and fun, and everyone is welcome! Pride Month is a great excuse to learn more about gay history in America! Watch a movie like The Times of Harvey Milk, The Celluloid Closet, Paris Is Burning or How to Survive a Plague. Pride Month is a time when the LGBT community is front and center and celebrated, and that can be so important for young people everywhere. Whether it's a rainbow flag at their favorite restaurant, a couple holding hands at a pride parade, or news coverage of pride on TV, the month really shows young people how many LGBT people and allies are in our communities. LGBT people throughout the country and the world head to cities for their pride parades during Pride Month. Concerts, parties, and marches are incredible, celebratory events that bring people together and give them the opportunity to have the time of their lives. Pride Month is great fun, but it's also an important time when issues related to the gay rights get more attention from news media. From gay marriage and adoption to transgender rights, our country still has a long way to go until everyone is truly equal. Pride Month is a great opportunity to learn about the fight for what's right, and to pitch in as well!